Home designers — indeed, all designers — love to use the cliché “form follows function.” In home design, this commonly used approach means the building’s form should be a natural byproduct of its use. While we don’t disagree that function and form could be closely related, we approach design a little differently. It’s more about art and function. We want to turn function into art so it elevates the design rather than being constrained. Built-in cabinetry and other features are not just practical — they can be skillfully used to create tasteful design. Why settle for the typical TV setup in the living room when you can blend it into a beautiful, stainless steel wall sculpture? Design shouldn’t have to be compromised for function. The necessity to be practical is not carte blanche to dismiss art or make it a secondary goal. Built-in features are by far not limited to the inside of the home. 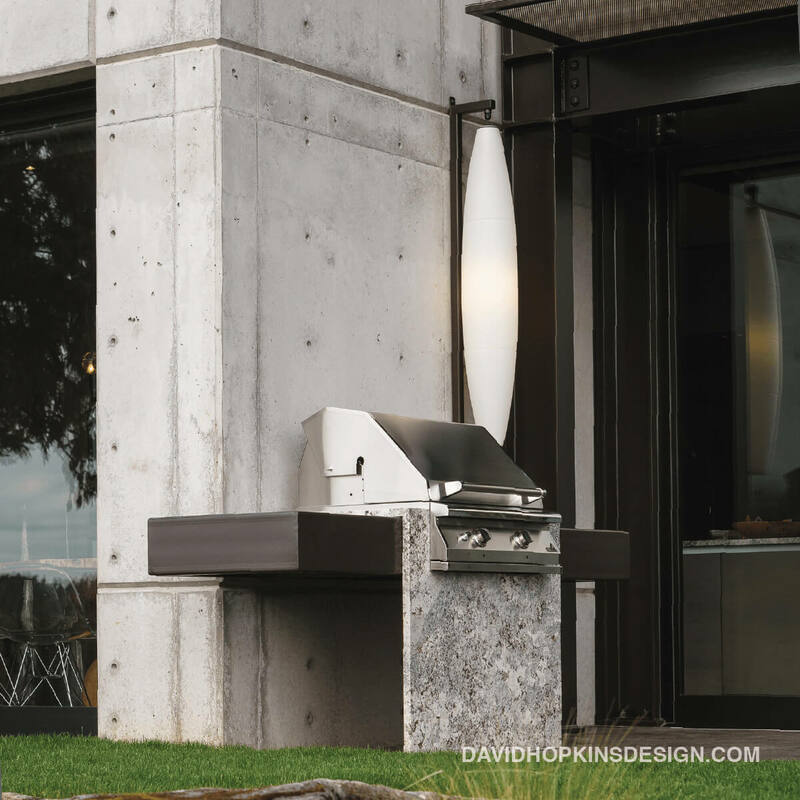 An outdoor barbecue is a typical example of how art and function can create a perfect union. Outdoor cooking is a popular pastime. But a freestanding barbecue too often becomes the easy answer. And sure, it gets the job done — but why would anyone just want to park a barbecue in front of an amazing structure? For us, something as simple as a barbecue is an opportunity for a creative challenge. What can we do to make it interesting? In this particular project, one of the challenges was an amazing view that we didn’t want to distract from. And while the clients wanted an outdoor barbecue, there was no place for it. Approaching the outdoor space as an extension of the indoor living room, our goal was to create a seamless transition between the two. The barbecue became a built-in feature that blended materials used both outside and inside in an interesting contrast. A light fixture added a warm touch. We didn’t ignore the practical side of things by any means. To simplify maintenance, for example, we didn’t include a warming oven or outside refrigerator, as those appliances typically see very limited use. Nothing can be overlooked as we go through the design journey with our clients — and when we look at a project with that in mind, the opportunities for art and function are endless.